A quick and easy salad that's a taste of Summer in every bite! 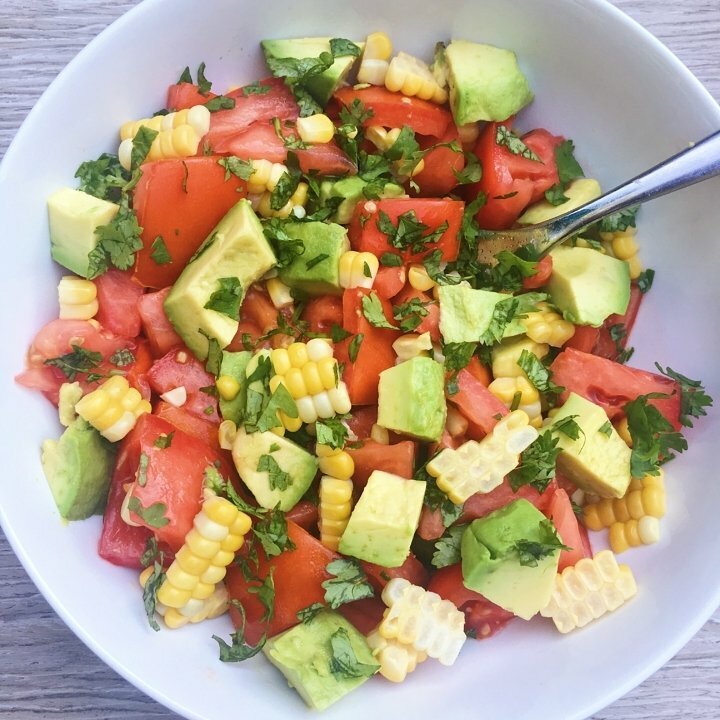 This 10-minute Tomato, Corn & Avocado Salad, seasoned with EVOO, fresh lime juice and cilantro, showcases fresh, summer produce and will have your taste buds singing! This simple salad has it all going on… a little juicy, a little crunchy, a little zesty, a little creamy, a lot delicious! We are headed on “down the shore” (where are my NJ friends?) next week and sharing a beach house with my family. With 10 of us, we tend to do a lot of grilling and simple, fresh salads like this one. Can’t beat a salad that literally takes 10 minutes to prepare and is a total crowd pleaser! This 10-minute salad is a taste of Summer in every bite! A little juicy, a little crunchy, a little zesty, a little creamy, a lot delicious! Recipe from a friend. Mix together in a big bowl, serve & enjoy!